There are many benefits that come from being your own boss. If you work for yourself, as an independent contractor, or you carry on a trade or business as a sole proprietor, you are generally considered to be self-employed. Self-employment can include work in addition to your regular full-time business activities, such as part-time work you do at home or in addition to your regular job. If you are self-employed you generally have to pay self-employment tax as well as income tax. Self-employment tax is a Social Security and Medicare tax primarily for individuals who work for themselves. It is similar to the Social Security and Medicare taxes withheld from the pay of most wage earners. You figure self-employment tax using a Form 1040 Schedule SE. Also, you can deduct half of your self-employment tax in figuring your adjusted gross income. You file an IRS Schedule C, Profit or Loss from Business, or C-EZ, Net Profit from Business, with your Form 1040. If you are self-employed you may have to make estimated tax payments. This applies even if you also have a full-time or part-time job and your employer withholds taxes from your wages. Estimated tax is the method used to pay tax on income that is not subject to withholding. If you fail to make quarterly payments you may be penalized for underpayment at the end of the tax year. You can deduct the costs of running your business. These costs are known as business expenses. These are costs you do not have to capitalize or include in the cost of goods sold but can deduct in the current year. To be deductible, a business expense must be both ordinary and necessary. An ordinary expense is one that is common and accepted in your field of business. A necessary expense is one that is helpful and appropriate for your business. An expense does not have to be indispensable to be considered necessary. 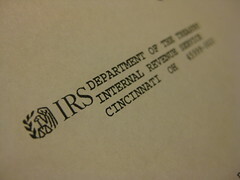 For more information go to the IRS website. If you are going to go full in when it comes to being self-employed, you might want to consider forming some type of business entity, such as an LLC or Corporation. For example, we are an LLC that is taxed like an S-corp, which just means that our company doesn’t pay any taxes – we do at a personal level. This eliminates the double-taxation issue a company being taxed as a C-corp can encounter. There are definite tax, and personal liability protection, advantages to operating under a formal business structure. I am not an accountant, so definitely get some professional advice before deciding on the right course of action for your company. Just know that there might be some tax advantages to being other than a sole-proprietor (which is what you are if you don’t have a formal business structure). That’s an excellent point and my first thought. There is no reason to pay the high sole proprietorship or partnership rates when an S corp is an available option. However, I have set up an S corp in KY, and I have to tell you that you need to consult a CPA first. There are many different forms you have to file. I have also closed an S corp, and again, there are many different forms to file on different levels, federal, state, and local.